This is the second book in the series and I enjoyed it even more than the first! The characters are written vividly and full of personality. The whodunit was really top notch and kept me guessing. There were secrets to unravel and enough suspects to keep me guessing. (I was unsuccessful in guessing the culprit I have to admit). I look forward to reading the next in the series! I voluntarily reviewed an Advance Reader Copy of this book. Hope signs up for a photography class with a famous food photographer. With his wife missing, she’s not sure class will go on, but the show must always go on, no? Go on it does, until his wife’s body is found in a fire that Hope calls in. Soon Hope finds herself being portrayed as the grieving husband’s mistress while his wife’s body isn’t even cold. But despite her frustration at the false story in the paper, she doesn’t believe the man is guilty of murdering his wife and begins asking questions. Soon hope is receiving threats intended to make her back off, but it only makes her look deeper and ask more questions. But will Hope be able to figure out who the murderer is before she’s next? Enjoyed this second book in the series and look forward too many more. The Hidden Corpse can be read alone if you have not had the opportunity to read The Uninvited Corpse. Hope Early is a divorcee who was a television baking show contestant until her life went up in flames. She now has a blog titled Hope at Home which is doing well, and Hope has been refinishing her new home. Hope also has a lively puppy named Bigelow (he is a cutie). She has signed up to take photography workshop from Cal Barnhart, a well-known photographer. Hope also gets wrangled into helping her sister, Claire get cranky Maretta Kingston elected to the Planning & Zoning Commission. In the book there is cooking, chatting with friends, eating, recipe planning, working on her home, walking Bigelow, working on her blog, Hope dealing with her sister, flirting and taking photographs (charming cozy moments). It was interesting to learn more about how a blogger markets their blog. I had no idea that bloggers had agents. Hope’s home sounds just lovely (I want it). She is doing a beautiful job at bringing the house back to life and making it into a home. There is flirting between Hope and Ethan Cahill, chief of police and longtime friend. Hope also feels parks of attraction toward Cal Barnhart. Personally, I wish the author had not gone this direction. The story would have played better if Hope had just been a good friend to Cal during this troubling time. The mystery had different aspects to it. We have a missing woman, a fire, and Peggy’s death. I like how they tied together. Hope takes cookies and other edible items with her to question people. She believes it will make them more willing to talk with her. Hope needs to work on her questioning technique. Her method ends up antagonizing people which makes them less willing to talk with her (she might need their help in the future). Detective Reid is one of those by-the-books officers who frequently tells Hope to stay out of the investigation. Hope is too curious and even the threat of arrest cannot deter her in her quest for answers. 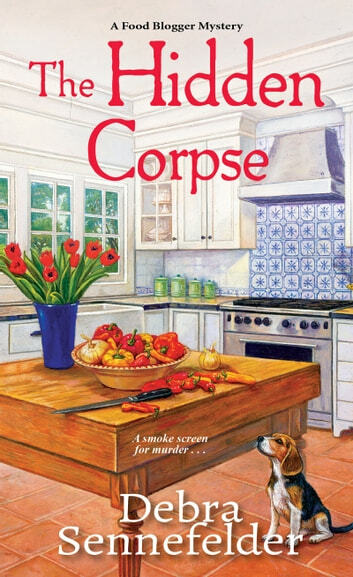 The Hidden Corpse is a humorous cozy mystery with an intriguing premise, a simmering whodunit, delectable recipes, political intrigue and one adorable canine. 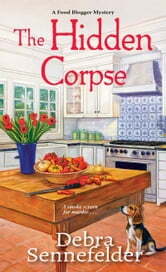 The Hidden Corpse is an outstanding and complex mystery highlighting some wonderful characters. I loved the Uninvited Corpse but the amount of negativity from Hope's friends in that book made me sad. In this second novel of A Food Blogger series there are still negative people, but that is fine because they are balanced by her friends who stick with her and are quite likable. Hope's feelings of guilt for not warning the victim's niece about an incident with a fire provide an understandable reason for her to get involved in the investigation. The Hidden Corpse held me throughout and left me happy, sad, frustrated and angry, but never at the book; I reacted to the situations in the book as I left my world behind. Thanks to Netgalley for providing an ARC to this wonderful mystery. I will be sharing my love for Debra Sennefelders newest book even more than I did with the first book in the series.